To travel to Honduras is to experience the heart of Central America. To a green paradise covered with tropical forests, a rich history, colonial cities and ancient archaeological centers of the Mayan civilization. In total, the country has more than 100 protected natural areas where the second most important rainforest in the Americas is located, after the Amazon. In addition to its thick vegetation, where rich fauna lives, Honduras also has beaches and islands where you can enjoy the sun and crystal clear waters. On its seabed is the Mesoamerican reef, the second largest coral reef in the world where you can see great marine biodiversity. In Copán, one of the main tourist centers of Honduras, is one of the most important archaeological remains of the Mayan culture. In its capital, Tegucigalpa, is where most of the country's commercial centres are concentrated, in addition to the La Tigra National Park, the first in the country to have this distinction. 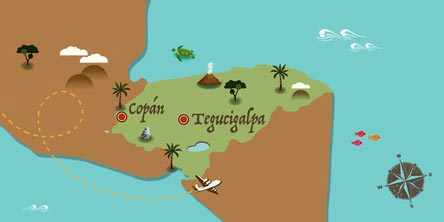 If Honduras has caught your attention, leave us your number so we can call you to discuss the voyage that awaits you.